Flavor Text: It is said that The Shining Pursuer could hunt you in your dreams, and what it did if it caught you there was best left unsaid. Danigral - 3 out of 5. Iod will slot into a lot of decks, but also won’t fit well into a lot of decks, especially if you already have a certain number of neutrals. He is slightly sub par in terms of stats, so really you’re looking at his subtype and ability. The Ancient-One subtype provides some additional protection from certain effects. 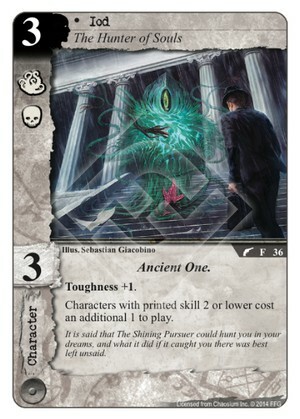 The ability can be great in certain deck types that are trying to slow down rush or stall a game, but really, an opponent will still have at least one or two turns without having to worry about Iod, and there are already a lot of characters, even cheap ones, that don’t worry about this ability. This might be a card that you have to make sure you take into account when deckbuilding. mnBroncos - 4 out of 5. I want more cards to slow the game down and this does just that. This is a great card for decks that want to slow the game down. It does cost 3 though so most likely won’t get it out the first turn so won’t hit the first turn plays which is a lot of the 2 or lower skill characters, but this is still a solid card. (not to mention a three cost ancient one is great since ancient one are immune to a lot of effects). Obtuse - 4 out of 5. I love this card. The only thing holding me back from giving it the full 5 out of 5 is that look on your face when your opponent plays his Claret Knight the turn before you were able to get Iod on the board. A great early game card that can really punch a lot of opposing decks right where it hurts. livingend - 4 out of 5. Playing Iod on turn one could actually be worth the tempo loss of spending a transient resource, as the effect is probably best applied early in the game. Outside of that, this card is pretty hard to evaluate without prior testing experience. “Characters with printed skill 2 or lower” is just too obscure a condition to be judged easily. Nevertheless I’ma hazard a guess and predict that Iod won’t be a slam-dunk playable in many decks. The role of a meta tool seems more appropriate, since he plays exceptionally well against decks that tend to go wide but can’t really convince against decks that focus on single threats and removal. Verdict: If jumpers and removal are unpopular in your meta, then this will definitely catch people with their pants down. WWDrakey & Ire - 4 out of 5. Iod is the poster “thing” for a solid neutral card - decent stats and an interesting passive ability that will allow decks with either good cost-to-skill ratios, very little characters to begin with or simply higher in cost-curve to slow down their opponents tempo nicely. The fun of having a cheap Ancient One available for all those AO-related effects (like Beings of Ib or Written in the Sky) is just gravy on top. I like Iod in a Ghoul deck because a lot of the best Ghouls have high skill. Plus, you can tie in the thematic Book of Iod, which works well with the Ghoul strategy of seeding the graveyard.